UPDATE: Scroll to the end of the article to see the final confirmed location of the compound. 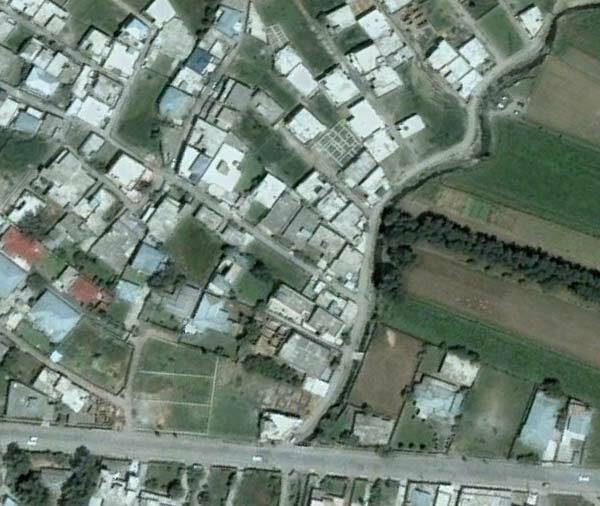 UPDATE 3: More posts: GeoEye publishes post-raid satellite image of Bin Laden compound, In the Situation Room, aerial imagery of the Bin Laden compound. 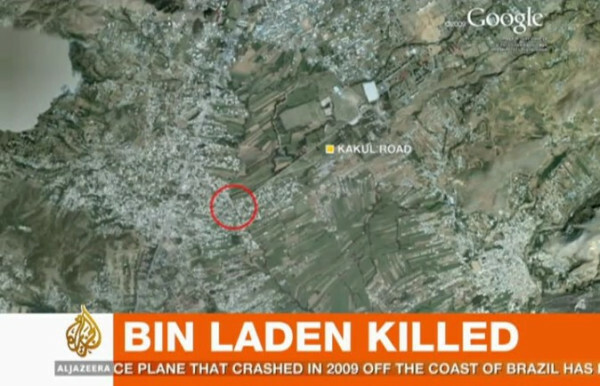 Osama Bin Laden’s death first manifested itself as short news items on Pakistani news sites: “Copter crashes on Kakul road – Monitoring Desk“, and indeed, later we would hear that one of the helicopters used in the raid on Bin Laden’s compound was damaged and destroyed. The repercussions of Bin Laden’s death are still uncertain, but this post will just concern itself with the location of this compound. Where exactly was it? Can we find it on Google Earth? Al Jazeera English mentions “a mansion” surrounded by high walls, comprised of “boxes” with no windows. 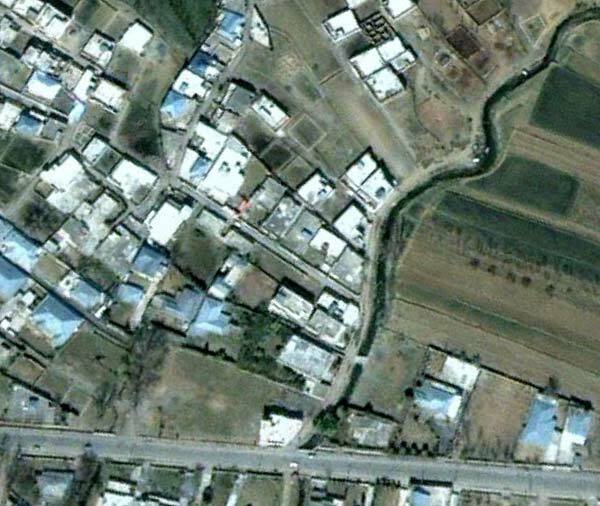 On a map of Abbottabad shown on their screen, Al Jazeera shows Kakul Road, and marks a specific location on that road, at the edge of some fields. He said the house was 100 yards away from the gate of the academy. The property was valued at $1 million, but it had neither a telephone nor an Internet connection. Its residents were so concerned about security that they burned their trash rather putting it on the street for collection like their neighbors. American officials believed that the compound, built in 2005, was designed for the specific purpose of hiding Bin Laden. Is it possible to correlate these disparate clues? Not really. The NYT is most likely to be wrong as to the location — Al Jazeera footage shows a backdrop of flat fields near the compound, not a hilltop. Also, from the position marked by Al Jazeera on the map, the front gate of the military academy is around 2km away along the straight Kakul road, rather than the “100 meters” mentioned by the AP eyewitness. I am inclined to give Al Jazeera the benefit of the doubt on this. They are the most likely to have people on the ground with the correct information, they are specific in their pinpointing of the location and their video footage supports their map. But there is one further clue we can use. Google Earth’s high-resolution map of the area has imagery from June 15, 2005 — almost 6 years old. One set of older imagery is available — from March 23, 2001. If the NYT sources are correct on Bin Laden’s mansion being under construction in 2005 (and on this they are likely to be correct, as it sounds like a piece of information from an intelligence source) then we should be able to compare the 2001 imagery with the 2005 imagery, and look for any mansion-sized construction going on in 2005. And Indeed, in the specific region marked by Al Jazeera, there is construction underway in 2005. Below is the imagery in 2005, then in 2001, then in 2005 again with the construction marked. Of course, it is possible that construction on the mansion began after June 15, 2005. And here it is as a downloadable KML file for Google Earth. It’s possible that these locations are wrong. The easiest way to find the precise place would be to walk on over there and take a look, but failing that, I will keep this article updated with more accurate information as it becomes available. UPDATE 9:53 UTC: Pakistan-based journalist Omar Waraich tweets that the location of the mansion, and where he is headed to, is Bilal colony/town in Abbottabad. On Google Maps there is a marker tagged “Bilal Mosque” which corresponds perfectly with the screenshots of Google Earth above. In other words, there is reason to be more confident that the above locations are correct. As you can see from the wide shot, the compound (not so much a “mansion” in terms of opulence”) faces the edge of an area with fields. Zooming in, we can see a section of red tarpaulin erected to hide ongoing investigatory activity. The mountainscape behind the compound can be reconstructed in Google Earth from the Bilal Town location pinpointed above. 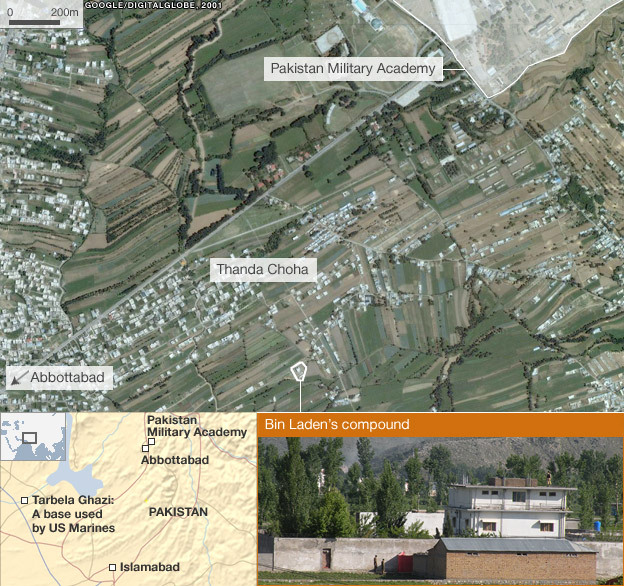 In other words, this is more evidence that Bin Laden’s compound is in the above location, most likely on the dirt road that runs along the creek visible in the Google Earth screenshots. Interesting, but in that location the imagery is from 2001, not even 2005, so if the intelligence accounts are correct, then this mansion cannot be it — it was already built by 2001. The photos are correct (also on Al Jazeera), but the map is not. It’s the same compound that already existed in 2001. At this stage, we see three hypothetical locations. We’ll see in the next few hours or days which one is the real one. 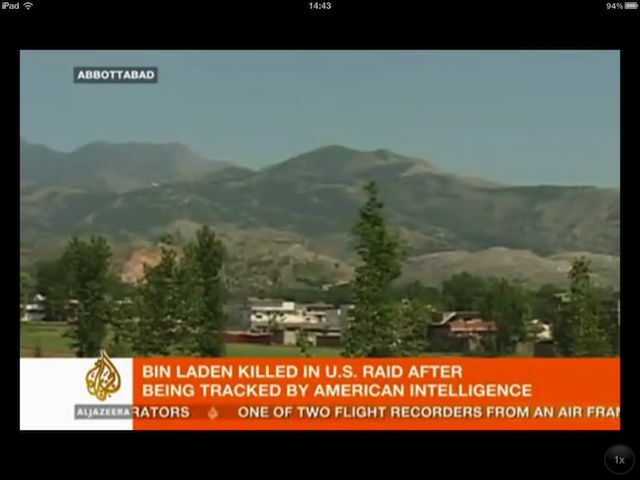 Pingback: Inside The Mansion Where Bin Laden Was Killed | Know All That! I think these locations are wrong. The key is the red scar on the hill in the background (in the screen shots) which I believe is located at “34 10 22N, 73 15 36E”. Based on trying to match the perspective view I put the compund somewhere to the west near “34 10 22N, 75 15 18E”. The view in the screen shot would be looking east. Another supporting fact is the press reports which state that the area was somewhat remote when construction started – the area sited by Stefan looks too built up in 2001. 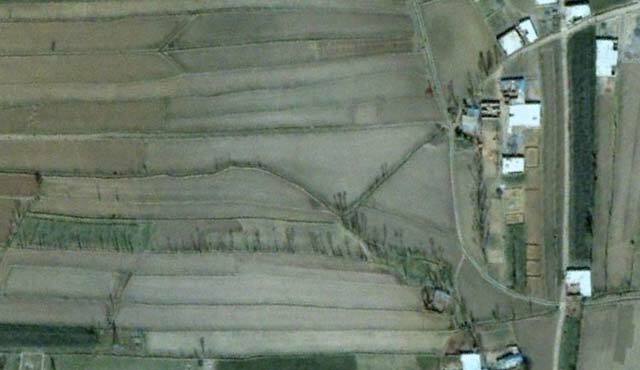 The screen shot also shows an area with only a few structures. I actually got a near perfect match of the screenshot looking east from “34 10 14N, 73 15 12E”. Mountains in the background match up as well as red scar. Have to set exaggeration to 1x to make it look right…. I spent several hours going through maps + PK press reports of the “Helio crash” reported prior to the Bin Laden news, and this is the area I guessed as well. Also, look at the Picassa pics scattered around that new development behind Bilal Town and NNE of the Army Housing Project (which is where press said the explosions came from). That’s gotta be the place. Abbottabad is roughly 700 miles from the arabian sea. If they used a Pave Hawk helicopter, with in-flight-refueling providing unlimited range, they would cruise at about 200 mph, with max speed at 224 mph. They DID transport him immediately, and could have made the trip in little over 3 hours. They don’t need his whole body for DNA testing, only hair samples or cheek swabs. I think you’ve got a typo there. You probably mean 34 10 22N, 73 15 18E. 75 east would be East of Srinagar, in the portion of Kashmir controlled by India. Yes, sorry! 73 deg east is correct – finger check…. I made a photo from Google Earth too, with annotations and distances. I think the BBC has it wrong. CNN is showing a video from inside the compound and the windows are elliptical. BBC is using a screenshot of wikimapia and I wonder if they are only using wikimapia as a confirmation. I know very little about helicopters, but does that compound look big enough to fit 2 – 4 helicopters? 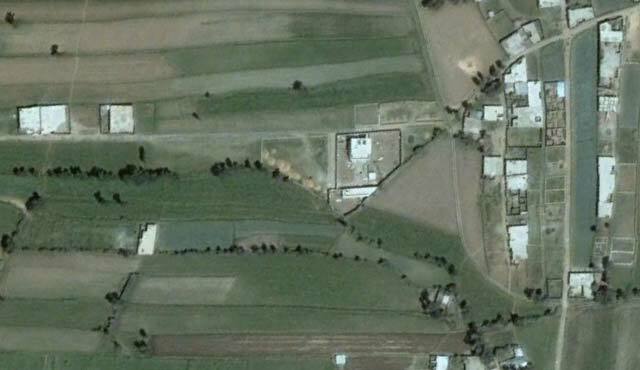 Pingback: “Justice has been done” – UPDATE: Osama Bin Laden compound found on Google Earth | Watts Up With That? All the stories have related the fact that the people in this compound burned their own trash as opposed to having it picked up. I don’t know anything about trash collection in Pakistan, but it sounds like something that would be more of a urban as opposed to rural thing? Congratulations on spotting it and with the confirmation. Early reports were indeed erroneous. They also said he didn’t have Internet…but there is clearly a huge satellite dish inside the compound – in all released pictures and diagrams. Please explain. Well, reports said there were no telephone or internet cables going into the compound. But a satellite dish doesn’t require phone or internet cables. The definitely had electricity. I Emailed a note to the White House in 2009 that Bin Laden was constructing a house in an erea within a few miles of a facility to treet him. Of course I did not know the area or streets but when I saw the possible construction sites in earlier earth shots I thought that was a possible local for him to hide. I never received a reply. Is this your way of laying claim on the $25M bounty? Oh, yeah, I e-mailed them, too! About the same place! AND I did it in 1991! I believe there will be little reaction by the Muslim nations to this occurrence. It is evident that the youth in their society has had enough from those controlling political forces. We may find that they may rejoice at the taking out of Bin Ladin. He, like our plos are, are bunch of old cranks, fighting a cause that the youth know very little about and could care less. What they want is life, liberty and the pursuit of happiness. Move over you old jackasses the world is changing. That includes me, since I’m 69. The final reported Ogle Earth location is correct. I overlaid the CIA provided image with the reported location (N 33.901944° E 70.093746°) and it matched perfectly. I posted the kmz file on Google Earth Keyhole, will update when the post shows up there. Here is the link to the .KMZ file. Again, CIA image overlay on Google Earth map data.